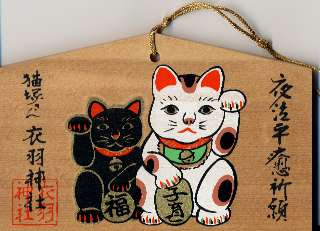 The "Beckoning Cat" is a favorite talsiman.
. Manekineko, maneki neko 招き猫 beckoning cat . Parents come there to pray if their young children cry in the night and pray for their safe upbringing. 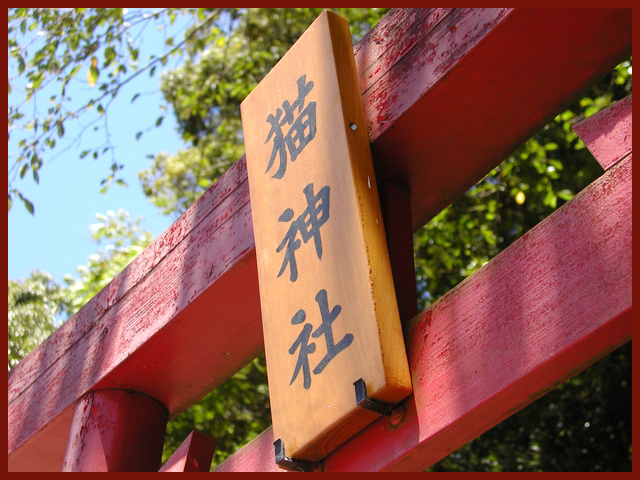 This is a sub-shrine of Shinmei Jinja 神明神社 in Fukui town. There is also a memorial stone for Horoha Daigongen 袋羽大権現碑. The samurai Kawasumi 川澄角平 expelled a cat which appeared in the figure of his wife and had this stone erected to thank the deity for its help. The monument is large and very impressive; it is dedicated to Monzaemon Chikamatsu, a joruri playwright in the mid-Edo period. The inscription says that the monument was originally located in Tennoji Park, but that local landowner Shozaburo Murogami obtained permission for it to be relocated to its current position as part of the 5th Domestic Industrial Exposition in 1901. Meanwhile, Nekozuka ("burial mound for cats") was built by Murokami in the same year. It was created using financial donations from local entertainers for the healthy rearing of cats, whose skin was used to cover the body of shamisen, a stringed musical instrument. The monument itself is very unique; it is shaped like the body of a shamisen.
. New Year - gomame (small dried sardines) . symbolizes a bumper crop or rich harvest. is part of the vast gardens at Sengan-en, the 17th-century estate of the dynastic Shimadzu family in Kagoshima, Japan. Like Shinto shrines throughout Japan, the cat shrine has a torii gate, a stone shrine for paying tribute, and a cleansing water fountain with bamboo ladle—only everything is much smaller. Also, at the very center of the stone shrine sit tiny ceramic effigies of two cats—two rather special cats. Sometime around the year of 1592, Yoshihiro (the 17th Lord of Shimadzu) sailed from Kyushu to Korea on a military venture. Along with his entourage, he carried seven cats—not as pets, but as furry, meowing clocks. Yoshihiro’s cats were special because you could tell the time by looking into their eyes. Over the course of a day, the pupil in the cats’ eyes changed with the sun. Each cat was matched to certain times, specifically 6:00 a.m., 8:00 a.m., 10:00 a.m., noon, 2:00 p.m., 4:00 p.m. and 6:00 p.m., and this is how Yoshihiro’s armada kept time with military precision during his long campaign. Alas, not all survived the long journey to and from Korea. In the end, only two cats made it back to Kagoshima alive. In gratitude to these cats’ service and loyalty, the Shimadzu lord built a shrine to them in 1602. After the Meiji Restoration (1868), the Shimadzu family relocated to their 75-room summer “villa” and the cat shrine moved with them. To this day, it is still an observed site of devotion dedicated to all cats—also, bizarrely, clocks. is a small island in Ishinomaki, Miyagi, Japan. It lies in the Pacific Ocean off the Oshika Peninsula, to the west of Ajishima. It is an inhabited island, although the population is quite small (around 100 people, down from around 1000 people in the 1950s). It has become known as "Cat Island" due to the large stray cat population that thrives as a result of the local belief that feeding cats will bring wealth and good fortune. The cat population is now larger than the human population on the island. 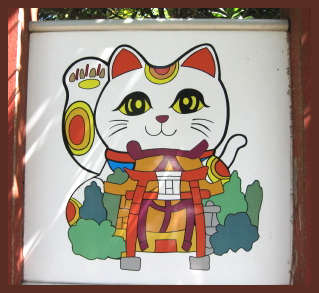 There is a small cat shrine, known as Neko-jinja (猫神社? ), in the middle of the island, roughly situated between the two villages. In the past, the islanders raised silkworms for silk, and cats were kept in order to keep the mouse population down (because mice are a natural predator of silkworms). Fixed-net fishing was popular on the island after the Edo Period and fishermen from other areas would come and stay on the island overnight. The cats would go to the inns where the fishermen were staying and beg for scraps. Over time, the fishermen developed a fondness for the cats and would observe the cats closely, interpreting their actions as predictions of the weather and fish patterns. One day, when the fishermen were collecting rocks to use with the fixed-nets, a stray rock fell and killed one of the cats. The fishermen, feeling sorry for the loss of the cat, buried it and enshrined it at this location on the island. 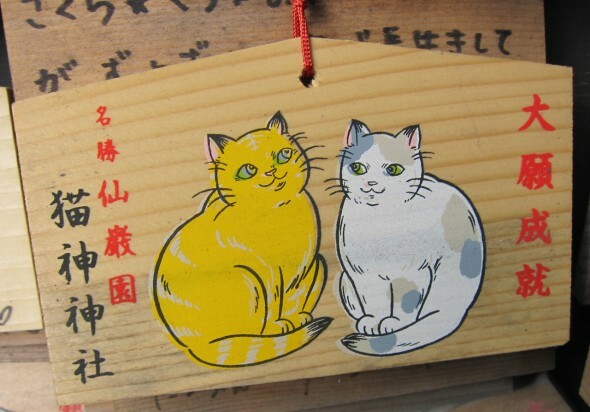 There are at least ten cat shrines in Miyagi Prefecture. There are also 51 stone monuments in the shape of cats, which is an unusually high number compared to the other prefectures. 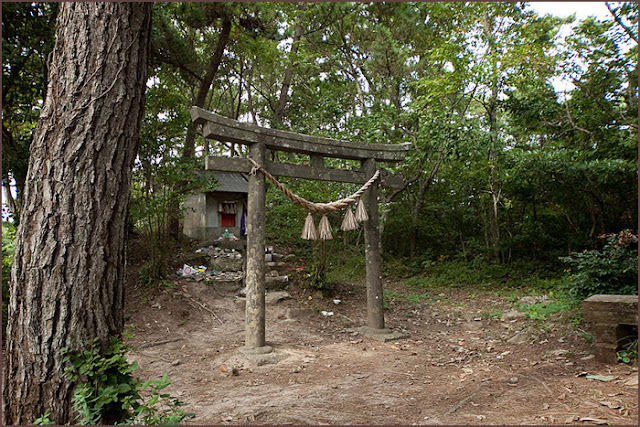 In particular, these shrines and monuments are concentrated in the southern area of the island, overlapping with the regions where silkworms were raised.
. komainu, koma inu　狛犬 "Korean Dog" shrine guardian . It is very famous for the birth place of fortune cat (招き猫, manekineko), and last place of Soji Okita (沖田総司), the greatest samurai warrior of Shinsengumi (新撰組). Now, it is well known as good luck shrine for love and marriage. There are many good luck items for love and marriage with fortune cat.
. Tokyo, Imado Shrine 今戸神社 Imado jinja .
. WKD : Cats and Haiku .
. Omamori お守り　Cat Amulets . 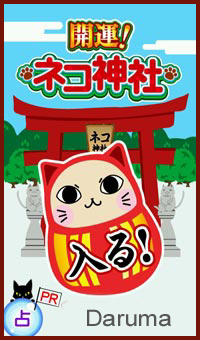 There are also nekodera, neko tera ネコ寺　猫寺 Cat Temples.